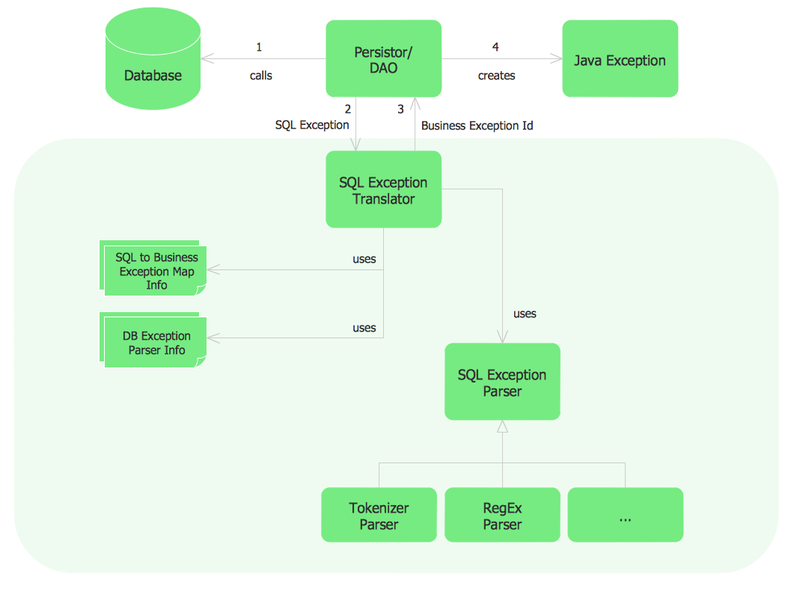 This sample shows the Flowchart that displays the architecture of SQL Exception Translation. You can see on this Flowchart the geometric figures that represent the steps of the process and are connected with arrows that show the sequence of the actions. The Flowcharts diagrams are widely used for designing, documenting, analyzing and managing the complex processes and programs in various fields such as science, business, engineering, architecture, manufacturing, administration, etc. Using the ready-to-use predesigned objects, samples and templates from the Flowcharts Solution for ConceptDraw DIAGRAM you can create your own professional looking Flowchart Diagrams quick and easy. This sample shows the Flowchart of the ACC general account creation. This Flowchart describes the Start point, the process of the handling the user requests and the End point – creating of the account. The shapes represent the subprocesses and the arrows between the shapes shows the sequence of the actions. This sample was created in ConceptDraw DIAGRAM v12 diagramming and vector drawing software using the Flowcharts solution from the "What is a Diagram" area of ConceptDraw Solution Park.